Strauss is coming off a tremendous sophomore season in which he passed for over 1,000 yards, rushed for over 600, and combined to score 15 touchdowns. 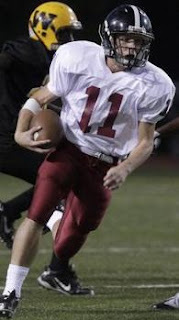 The junior signal-caller will be looking to lead the Chesty Lions to the playoffs for the first time in three seasons. Last season Burt rushed for 782 yards and seven touchdowns while splitting the running back duties with Will Livingston. This season (at least early on) it looks like Burt will be carrying the majority of the load himself. The Vikings have had four 1,000 yard rushers since 2004, and we’ll most likely see Burt added to that list if he can stay healthy. With Faerber it’s not a question of his abilities, but rather how well SM East’s new quarterback Dakota Collins can distribute the ball to the talented playmaker. SM East was one of the more impressive teams in the metro in 7-on-7 competition this summer, with Faerber as their top receiver. The SM East faithful hope it will translate onto the gridiron. Root's transfer to Olathe North during the offseason headlined a plethora of talented running backs that made the transfer attempt to Olathe North, including Orange Mooney (successfully) and Teddy Colbert (unsuccessfully). To this point in his career Root has been alot of talk, and besides the occassional touchdown here and there, not alot of walk. But, bigger things are expected of Root in his senior season at Olathe North. This fifth slot is always high in liquidity and Lowe could easily climb the list or fall to the honorable mention ranks depending on how he plays at SM Northwest in week one. New faces will inevitably emerge on the scene as well, and they could slip into this slot. What we do know about Lowe is that he was close to 1,000 yards rushing last season, and he’ll probably play an increased role for the Lancers as a senior. Honorable Mention: Orange Mooney, Olathe North; Connor Middleton, Olathe Northwest; Anthony Buffalomeat, Lawrence; Junior Williams, Olathe East; Teddy Colbert, Olathe South. The Eagles are coming off consecutive state championship appearances and they are seen as the preseason favorite in the SL and in Class 6A by many. Replacing Victor Simmons and Adonis Saunders certainly won't be easy, and the Eagles don't have much preparation time. They face Olathe East in week one. It won't be easy for SM East to repeat the 8-1 regular season record from last year, but the Lancers will be more focused on the playoffs this time around. Last year they lost in the first round to Olathe South. This season the pressure will be on to at least win one playoff game and advance to the Sectional Round. Lawrence High has become a darkhorse candidate for the league title over the last few months and they have a highly experienced roster returning to match it. Their biggest hurdle will be their daunting schedule. The Chesty Lions have road trips to Olathe North, Olathe East and Olathe South, not to mention home contests versus SM West and SM East. The Falcons return a solid core of talent on both sides of the ball, including their quarterback Frankie Seurer and center Scott Gourley, a First Team All-Sunflower League selection from last year. The Vikings, like the Falcons, have the luxury of returning their starting quarterback in Armani Williams. 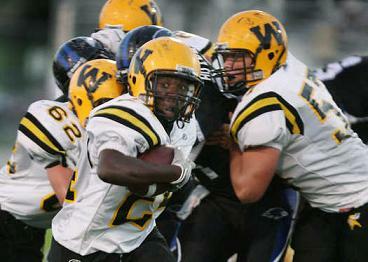 They also return running back Tre Burt who was a Second Team All-Sunflower League selection in 2010. If their new starters can step up quickly the Vikings have a chance to make a big push towards the end of the season. The Ravens have virtually no expectations from the media heading into 2011. Their only returning starter of note is running back Connor Middleton, and some are even calling into question his ability to carry the load through the nine game schedule. This would be the perfect time for Olathe Northwest to sneak up on their opponents. Full preseason analysis of each team available here. What stats does Treshawn Root have to show for? Why is he getting all the talk with what little stats he has? Im just saying. Umm... First of all, way to go Anonymous there *sarcasm*. Secondly, Orange Mooney is still at Olathe North. That was one of those false rumors from people that posted Anonymously. Thanks for the heads up! The most challenging thing about covering high school football is simply keeping tabs on which players are at which schools, given that transfers are not reported by athletic departments the way they are in the collegiate ranks. yea, Mooney is still at ON, he played in the scrimmage and made some good runs. Yeah, Orange is wearing number 11... and anytime Eli. 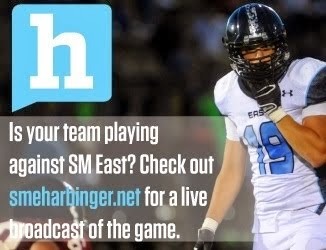 Love the blog, I'm a longtime HS football fan with some experience in the Business. Sniper, did he or Treshawn get the majority of the carries?